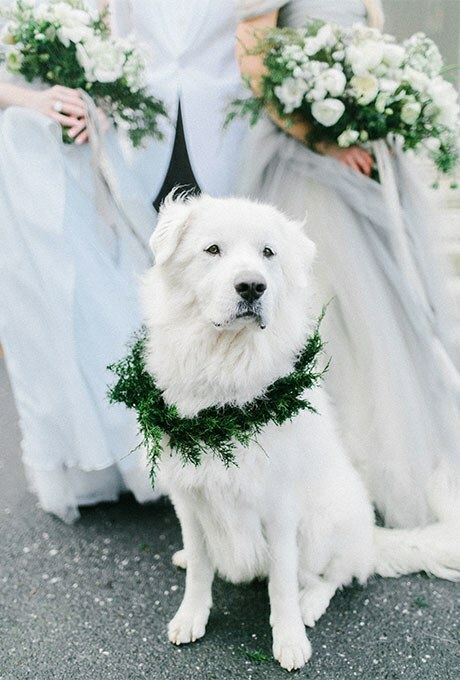 in 2011, Brides magazine found that nearly 5% of american brides included a pet in their wedding party, and that statistic doubles during the ceremony and/or reception. we're not surprised. with many pets being invaluable members of families everywhere, why wouldn't you want your furry friends to celebrate your big day with you alongside all your loved ones? we gathered some inspiration on how to incorporate pets into your special day. from bow ties to tuxedos to flower crowns, your beloved companions can be dressed to the nines on your big day. what better way to capture the love that goes into your big day than incorporating your pet in your timeless shots? dogs can attend your big day as well. man's best friend can even play the role of "man's best dog," "dog of honor," or a flower girl, if you wish.